The 2017 LIFT Campaign is about to commence. Look here for more information soon. This year’s campaign will feature amazing items to bid on in our bookish auction, PLUS a month-long effort to spread the word and raise awareness. The LIFT T-shirt campaign will be coming soon too! This year’s LIFT charitable partner is KultureCity, specifically this great organization’s LifeBOKS program. Children with autism are significantly prone to wandering. Many of them often get into dangerous situations, causing significant stress and worry on families who have not received any guidance or advice on preventing this dangerous behavior. LifeBOKS was created to prevent that, and save lives. The funds raised through this year’s LIFT campaign will go to purchase these life-saving kits for ASD families. 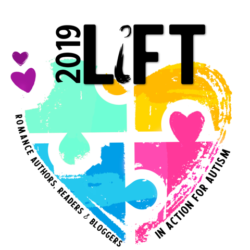 Our author list will be posted soon, but you can get started supporting LIFT today by ordering your copy of the Ever in the After anthology. 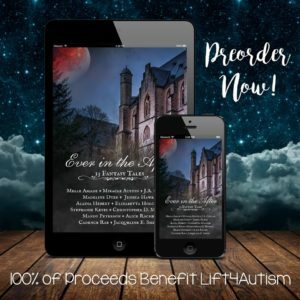 NY Times, USA Today and Bestselling authors present…Ever in the After a Charity Anthology….100% of all proceeds will be donated to this year’s Lift4Autism charitable partner. In Ever in the After, 13 authors come together to explore fantastical realms full of supernatural creatures, dark intrigue, and spells that may–or may not–be curses.